The Scenic Artist Apprentice Program has a new home thanks to a generous donation by Tony Argente of Broadway Stages. The facility is located in the Guard House of the former Arthur Kill Correctional Facility which is being converted into sound stages. It features a modern kitchen/lecture room, a separate tool room and a large studio space with a brand new paint deck. 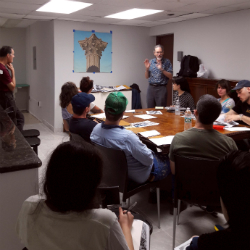 The first class was held on Saturday, September 15th, taught by Scenic Artists Peter Miller, Rand Angelicola and Rick Daly. Apprentices currently enrolled in the program are: Stephanie Bell, Rosalind Bunting, AJ Chu, Whittnie Daniels, Jared Flynn, Jocelyn Henry, Shane Intersoll, Otto Medvetsky, Sol Metcalfe-McDonald, Athena Parella, Martin Petrov, Sarah Rigney, Hanna Wellish and Murphey Wilkins. The Scenic Artist Apprentice Program would like to thank the trustees Matt Antonucci, Jeff Davis, Emily Gaunt, Neil Mazzella, Bevelry Miller and Nicole Stiegelbauer for their continuing support, and the following people who have kindly contributed supplies to the new space Roland Brooks, Emily Gaunt, Loconsolo, Neil Mazzella, Beverly Miller, Rebecca Perrenod, Nancy Orr and Diane Rich. Additional donations of supplies are welcome. To arrange, please contact Apprentice Administrator Kelsey Harro. Photo courtesy of SA Rick Daly.